If the Wise Men (The original Greek word is magos which means “magician”) had lived in North America instead of the Middle East, they would have probably offered a gift of Copal to baby Jesus instead of Frankincense. Copal is a delightful tree resin with a piney-lemon scent. Unlike Frankincense, which can become bitter the longer it burns, Copal is sweet from start to finish. Copal is also much easier to crush into powdered form with a mortal and pestle. Copal has long been used by the Maya, Nahuatl (Aztec), and Zoque people in Mexico and Central America. Its name is a variant of the Nahuatl word copalli which simply means “incense.” The Mayans call it pom. Copal played an important role in the religious rites of these ancient tribes. It was considered to be the “food of the gods,” and was burned as an offering to them. 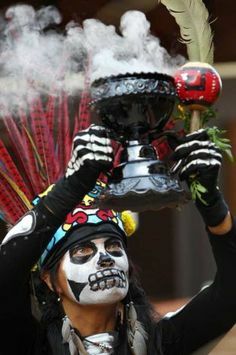 Today Copal is still used for ritual purification and is often used at Day of the Dead gatherings and ceremonies to help the dead find their way back to the spirit world. For Wiccans, Copal’s planet is the Sun and its element is Fire. It is used for protection, love, purification and exorcism. Scott Cunningham and Paul Beyerl say it can be used as a substitute for Frankincense. Copal is also used in the African-American conjure tradition which attributes similar magical qualities to the resin. Catherine Yronwode, in her book Hoodoo Herb and Root Magic, says that in in the United States Christians in the Spiritualist tradition recite the 23rd Psalm while burning Copal or speak aloud their gratitude for blessings received. This should be enough info for you to give this wonderful incense a try. The only word of caution is to make sure you buy a high quality version of Copal. It can vary in color from white to pale yellow to almost orange in color. There is also a black version of it as well. The general rule of thumb seems to be the lighter the color, the better the quality, although not everyone is in agreement on this. You can also buy Copal in self-igniting incense sticks but I prefer to use it in its natural state. I grind it and add it to incense blends, but it is also wonderful when it’s burned by itself. This entry was posted in Herbology, Incense, Magic and tagged Christian, Copal, Incense, Pagan, Resin, Spirituality, Wicca. Bookmark the permalink.